තාරකා ද්වාරය එහෙමත් නැත්නම් Star Gate, තව දරුණුවට කිවොත් සක්වල චක්‍රය ගැන ඔබ අහලා තිබෙනවද? ඔබ දන්නවද ලෝකයේ පවතින ප්‍රබලම සක්වල චක්‍ර සංකේතයක් තිබෙන්නේ ලංකාවේ කියන දේ. ඔබ කුඩා කාලයේදී හෝ ඔබේ තරුණ වියේදී රන්මසු උයන බලන්නට එක වරක් හෝ පිය නගලා තිබෙනවානම් ඔබ අනිවාර්යයෙන්ම මෙය දැකලා ඇති. ඔබ මේ ගැන දන්නේ නැත්නම් අනුරධපුරයට යන වෙලාවක අනිවාර්යයෙන්ම මෙය නරඹන්න අමතක කරන්නට එපා. මේ පහතින් තිබෙන්නේ මෙහි ඡායාරුපයක්. මම මේ ගැන ලිපි කිහිපයක්ම අධ්‍යනය කළා, මට මේකට සම්බන්ධ පැහැදිලිම ඡායාරුපය ලැබුනේ Wikipedia වෙබ් අඩවියේ. Wikipedia කියන්නේ නිරවද්‍ය තොරතුරු ලබාගන්න එච්චර හොඳ තැනක් නොවුනත් මේ ඡායාරුපය ඔබව වෙනම මානයකට ගෙන යාවි. මේකේ original image එක 9MB වුණා. නමුත් WordPress වලට upload කරන්න තියෙන අපහසුකම් මත මම මේක compressed කළා. මේ තාරකා ද්වාරය ගැන මුලින්ම සටහනක් දක්වන්නේ H. C. P. Bell C.C.S., Archaeological Commissioner විසින්. ඔහු විදේශකයන් විසින් විනාශ වුනු අනුරාධපුරයේ ඇවිදමින් Archaeological Survey of CeylonNorth-Central and Central Provinces.Annual Report – 1901 නිර්මාණය කරමින් සිටියේ. ඔහු මේ ගැන කරන සඳහන් කිරීම Lanka Paranormal බ්ලොග් අඩවියේ http://lankaparanormal.blogspot.com/2011/06/sakwala-chakraya.html බ්ලොග් පිටුව හරහා කියවන්නට පුළුවන්. ඉහත රූපයේ ඔබට දකින්න පුළුවන් සැබෑවටම මේ සක්වල චක්‍රය පිළිබඳව අඳින ලද දල සටහනක්. 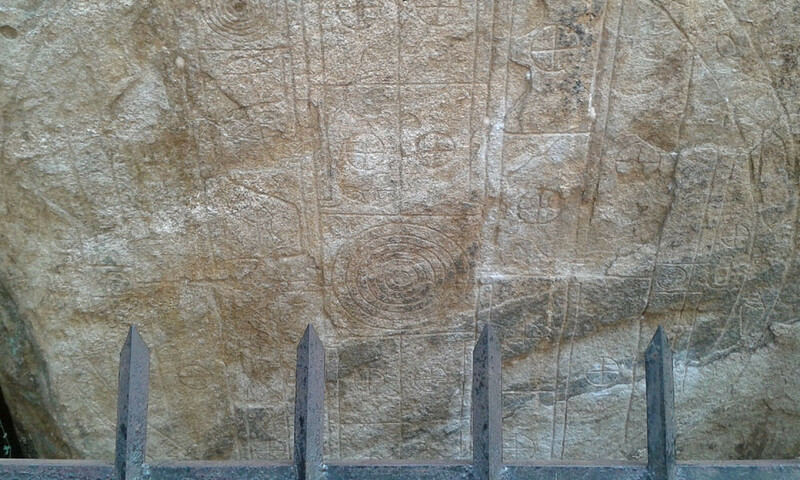 This weird circular diagram, incised on the bare rock -even more unique in a way than the elephant bas-reliefs of Pokuna A-may with every show of reason claim to be an old-time cosmographical chart illustrating in naivest simplicity the Buddhistic notions of the universe. The concentric circles with their interspaces at the centre of the chakra can assuredly mean only the Sakvala, in the centre of which rises Maha Meru, surrounded by the seven seas (Sidanta) and walls of rock (Yugandhara, &c.) which shut in that fabulous mountain, l,680,000 miles in height, half below, half above, the ocean’s surface. Sun and moon (in the second strips) lie on either side of the Sakvala : round about in space are scattered innumerable other worlds represented by quadrisected circles. * Below and around is the “world of waters” (i.e., the circular band) in which swarm gigantic uncouth denizens-fish, turtle, crab, chank, and other marine fauna. ! This ancient “map of the world”-perhaps the oldest in existence is of quite extraordinary interest. Its presence here, within an eremite’s cave at an out-of-the way nook of ancient Anuradhapura, testifies to the antiquity of that astronomical lore still pursued in some of the Buddhist monasteries of Ceylon. ඉහත සටහන තබන්නට ඇත්තේ HCP Bell මහතා විසින්. ඔබට දකින්න පුළුවන් රචකයා දක්වනවා මෙහි මධ්‍යයේ පවතින්නේ මහමෙරු පර්වතය බව. මේ මහා මේරු පර්වතය වට වෙලා තිබෙන්නේ සත් මුහුදු එහෙමත් නැත්නම් සිදන්තයන්ගෙන් සහ යුගන්දර නම් වූ මහා ගල් බැම්මකින්. මේ සියල්ලේම අන්තර්ගතයට අපි කියනවා සක්වල කියලා. ඒ වගේම මේ සක්වල පවතින්නේ චක්‍රයේ අන්තර්ගත වෙලා. ඒ වගේම ඔබ දකින්නට ඇති මෙහි සිටින මුහුදු ජීවින්. බුද්ධාගම මේ ගැන පැහැදිලි කරලා තිබෙන විදිහ ගැන මට ලොකු අවබෝධයක් නැති වුනත්, මේ සක්වල ගිගුම් දීම, මහමෙරු පර්වතය ගැන කෙරෙන සඳහන් කිරීම් ස්ථාන කිහිපයකම දකින්නට පුළුවන්. මේ නිසා බුදුදහමෙන් පෝෂණය වුනු අපේ අනුරාධපුර යුගය, මේ වගේ අනර්ඝ නිර්මාණ ලෝකයට දායාද කරන්නට සමත් වෙලා තිබෙනවා. දැන් කියන්න හදන්නේ අපේ කාලයේ සක්වල චක්‍රය ගැන. මේ පහත තිබෙන පෝස්ටරය ගැන මට අමුතුවෙන් අටුවා ටීකා ලියන්නට වුවමනා වන්නේ නැහැ. අපේ ගලේ කෙටු ද්වාරය තවත් පැහැදිලිව ඔබට මෙහි දකින්නට පුළුවන්. මෙවරත් Google I /O නොකඩවා සිව් වන වතාවටත් Dialog Ideamart එක්ක GDG Sri Lanka දැවැන්තයන් ඔබ වෙත තිලින කරන්නට සුදානම්. මැයි 7 සවස 6 ඉඳන් මැයි 8 උදේ 5 වෙනකන් මුළු රාත්‍රිය පුරාවටම SLECC – Sri Lanka Exhibition and Convention Centre ඔබ වෙනුවෙන් විවෘත වෙලා තිබෙනවා. මේ ලිපිය ලියන මොහොත වෙනවිටත් ඔබ අපි හැමෝම බලාගෙන ඉන්නේ registrations open වෙන්නේ කීයටද කියන කරුණ. මේ දින කිහිපය නිදි වර්ජිතව සිටින්න. එය මේ මොහොතේද කියන්නත් බැහැ.